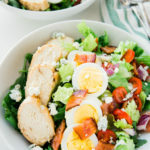 Not only is this keto cobb salad tasty, it’s full of nutrient-dense vegetables and can easily be made ahead of time if you’re into meal prepping. Just whip up all the ingredients, put them in separate containers and place them in your fridge. Or, you can do the mason jar salad method by simply adding the chicken first, followed by the bacon, eggs, bleu cheese, tomatoes, onion, spinach, and romaine. Make a couple of jars ahead of time for a grab-and-go lunch option. What Are the Health Benefits for These Vegetables? Spinach and romaine are full of vitamins, minerals, and antioxidants. They are anti-inflammatory and nutrient dense. They contain phytonutrients such as magnesium and potassium. Fun fact: magnesium is great for promoting remineralization in your teeth. Tomatoes are also anti inflammatory and a high antioxidant food containing phytonutrients such as lycopene, which belongs to a group of pigments called carotenoids. Research shows that foods containing lycopene are closely tied with enhancing immunity and cancer risk reduction, specifically in prostate cancer [*]. Red onions, whose species name is Allium cepa L, are in the same family as leeks and garlic. They contain oils that hold sulfur, which is why their smell and taste is so powerful. They may have a strong taste but that’s not the only thing strong about them. Onions and members of their family contain cancer fighting properties, according to studies [*]. Fun fact: when cutting onions you are puncturing their cell membranes that store alkenyl cysteine sulphoxides, which is why you tear up. But don’t worry, that’s a small price to pay for the amazing health benefits. On a baking sheet lined with parchment paper, add the chicken and sprinkle sea salt and pepper to desire. Cook chicken for 30 minutes or until internal temperature reaches 165 degrees. Slice and set aside. In two bowls, build the salads by adding spinach, romaine, sliced chicken, sliced tomatoes, chopped onion, eggs, bacon, and bleu cheese. Drizzle with lime juice, sprinkle with sea salt and pepper, and toss to combine.